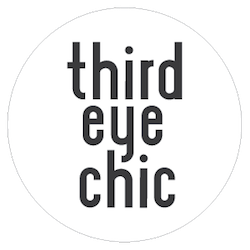 - This fall is all about plaid, tartan, houndstooth (if only I had a dollar for every time I said houndstooth around here), and checks in general. This coral plaid coat is certainly being put to great use by N. And remember these checked sweaters from last year? Looks like all these amazing checked outfits (and accessories) are back in style. - Sneakers and slip-ons are huge this season! 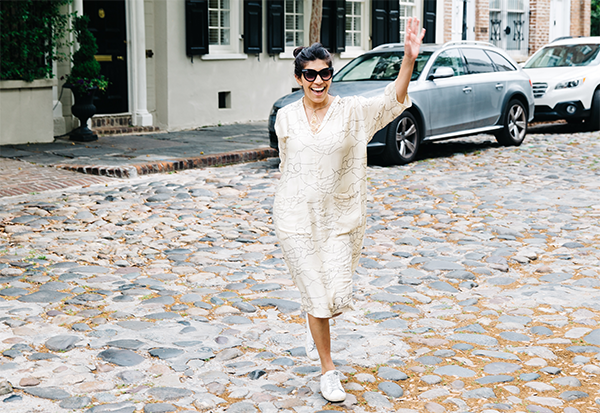 Nike sneakers are definitely trending, chucks are going strong, and really all sorts of sneakers and slip-ons are seen everywhere around town and online. - If you haven't bought a wool fedora yet, go buy it. Now. - I've been noticing a lot of classic Chanel quilted bags, and cross body bags in general. - Last but not least, I am definitely going plum crazy this fall. What's you fall color palette looking like? Too much silliness this morning. Love this note from #fallontonight. "Thank you, random warm days mixed in with random cold days in the Fall, for being mother Nature's way of saying "Y'all don't know me!"" 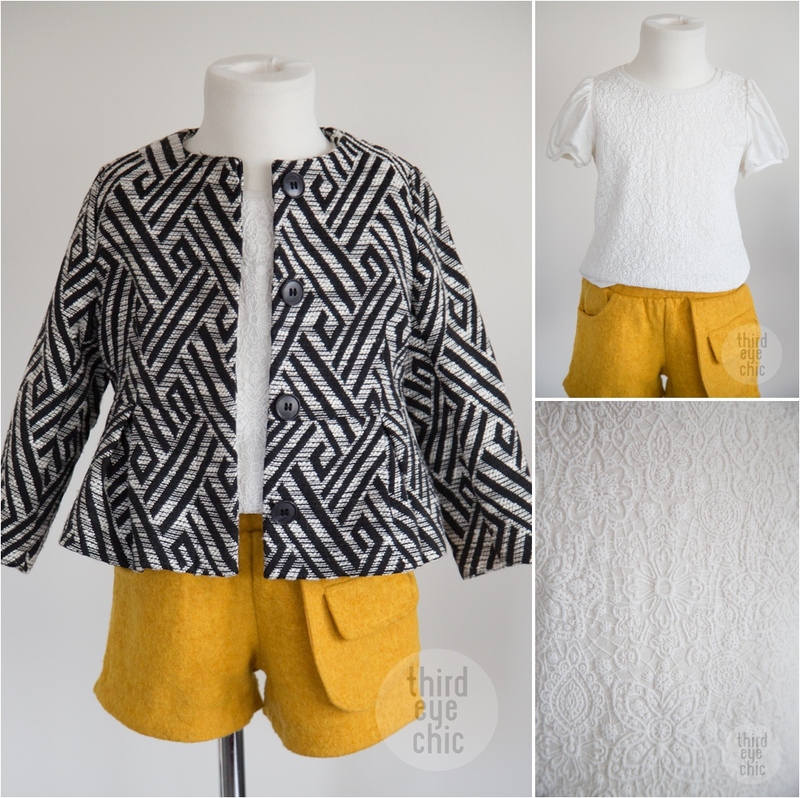 Isn't this outfit perfect for warmer fall days like today? Corduroy floral skirt with striped tee and solid cardigan to balance the look. You all probably know by now how obsessed I am with mustard color and mustard and B&W combo. I think this obsession is here to stay so you'll continue to see these colors a lot around here. N: "Mom, I want to wear a skirt because girls wear skirts and dresses and boys wear pants." Me: "(sigh) OK but it's really cold outside and you can't just wear a tee and a skirt." So after a couple rounds of negotiation, this is what we agreed upon. She wore these golden shoes to go with the outfit. How long do I have before I can no longer dictate her outfits? Anyone? A steady stream of tea, some Sinatra, editing, and blogging. Aren't rainy days just meant for that? 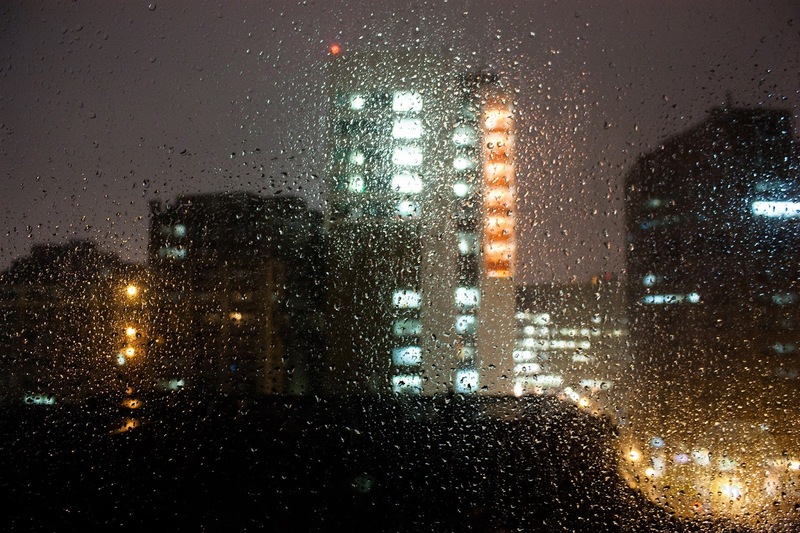 Just thought I'd share one of my favorite images from a rainy night in Boston. 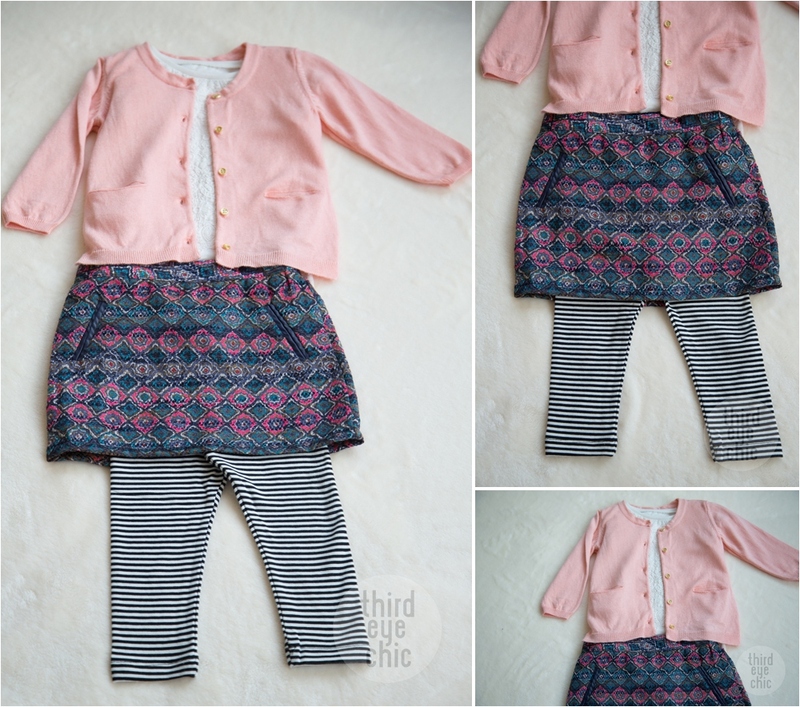 Toddler Girls Fashion: multi-season clothing? Some brightness and sunshine for you on a rainy day in Boston. I am actually wondering how many of us carry same pieces of clothing from one season to the next. Especially from spring to fall. Obviously there is a huge difference in colors, textures etc going from spring into fall; however, I feel like there are certain pieces that can easily fall under multi-season clothing category. Don't you agree? 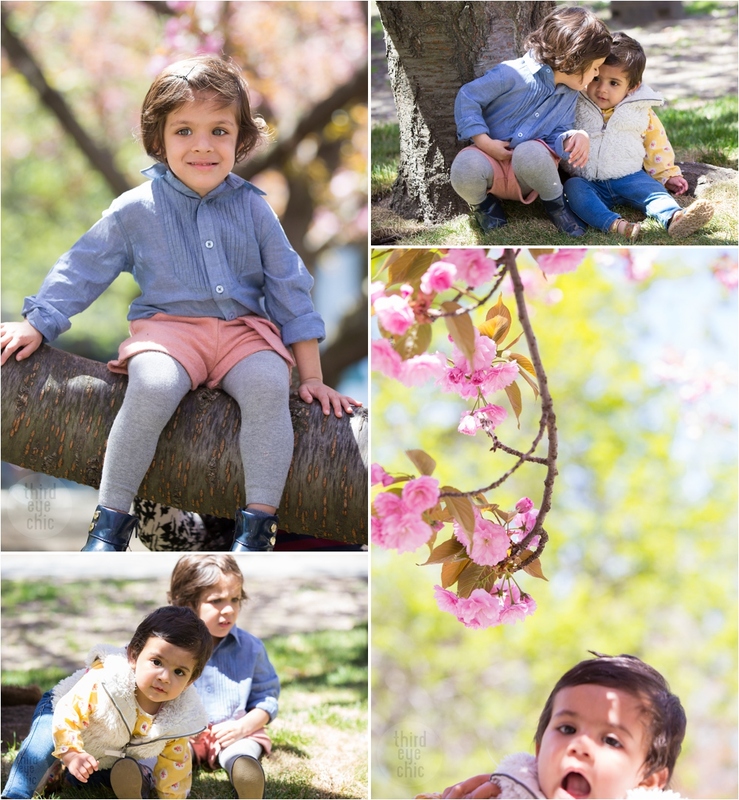 It's pretty evident from the cherry blossoms that these pictures were taken in spring; however, I can totally see N wearing exactly the same outfit in fall with additional layering. Even O can wear the same vest and jeans, with perhaps a darker or more neutral top. 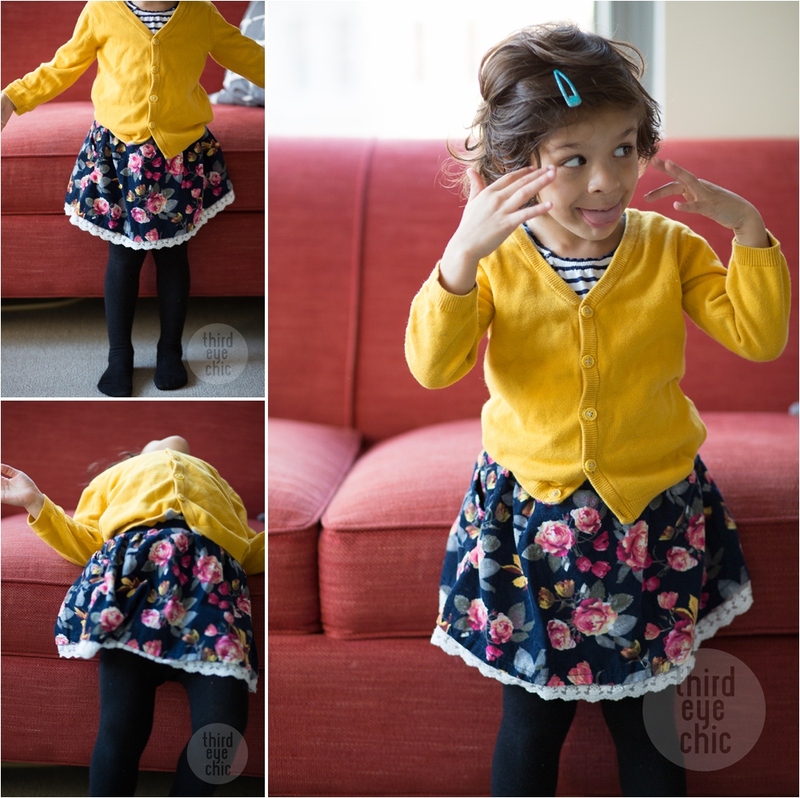 I especially like to be practical with kids' clothing, and make good use of their clothes until the clothes either wear out or don't fit anymore. Most of these pieces are styled differently in several of my other blog posts. You can check them out here, here, here, and here. 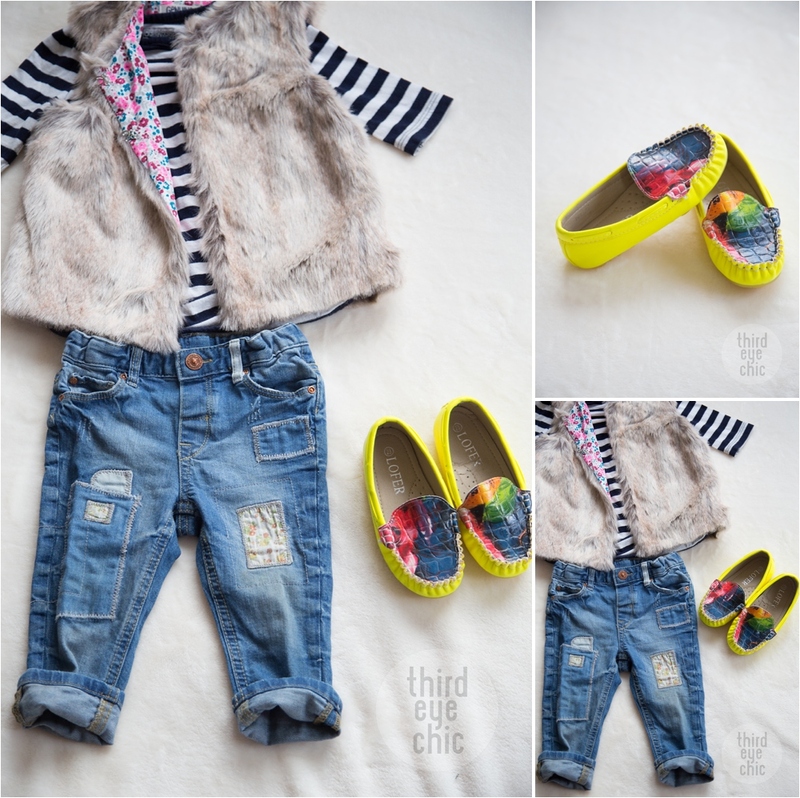 Toddler Girls Fashion: Pop of Color! This outfit is great for work, client meetings or networking events. You can dress it up or down, and get a lot out of it. I wear a lot of bright colors and I love this COS top. I have been waiting for COS store to open its doors in NYC since quite a few months. I was in the city recently; however, just based on my online searches, I don't think it's in the US yet. Stud earrings are not my usual style but when I saw these quirky camera stud earrings, I had to add these here. These are sold out online, or I would have placed my order by now. Photographer's bias is pretty obvious here but I still think these are very cute. A navy blazer with golden buttons is a foolproof classic. I own one and wear it a lot! Overall, this look really works for me. My girls are usually in bed by 8 p.m. or, if staying up late, somewhere very causal with us, sometimes even in their PJs. If, however, I ever have to dress them for a formal evening out, this would be my outfit of choice. A printed shift dress with dressy tights and shoes, and a simple A-line coat in a contrasting color. Holiday season is not too far away so a couple of pieces to consider seriously. How have you guys been? I was MIA all of last week but am back now. My parents were visiting us from India and I have been busy hanging out with them, just chilling, eating delicious mom-made food, and just getting pampered. It's good for you once in a while, non? They are back home now and it's also time for me to get back to work and blog. Do you remember this H&M jacket from last year? 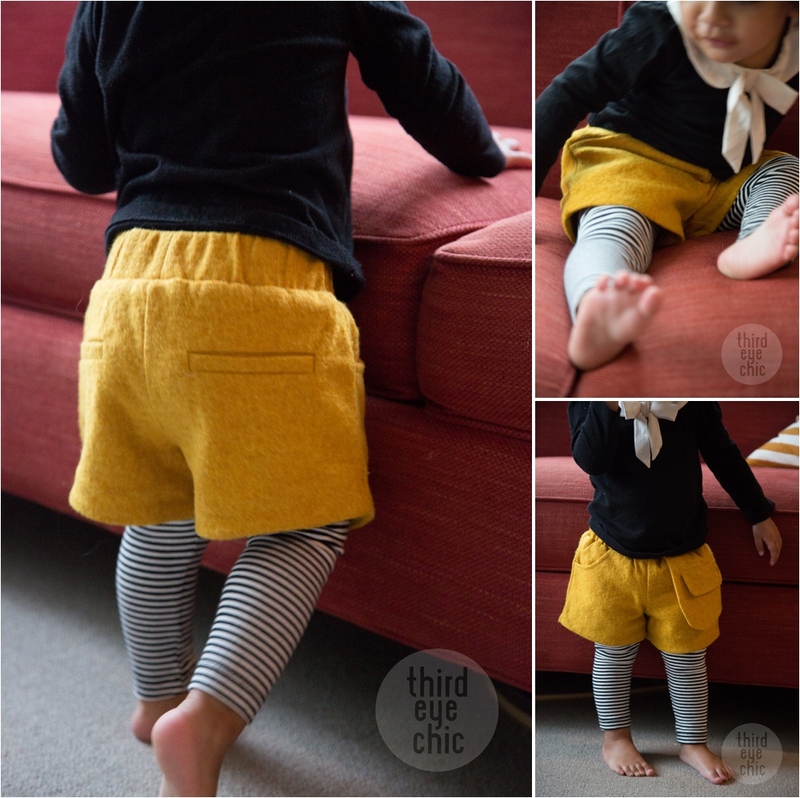 And these mustard felt shorts too? Well, we are still in love and they still fit. These shorts actually fit both my daughters now, and I'll soon be posting the younger one wearing these. It's been a forgiving fall so far, but I am sure the chillier days are not too far away. I would add tights to this outfit for a perfect fall look. White top: Target Similar here. Toddler Girls Fashion: Cutest loafers on the planet! 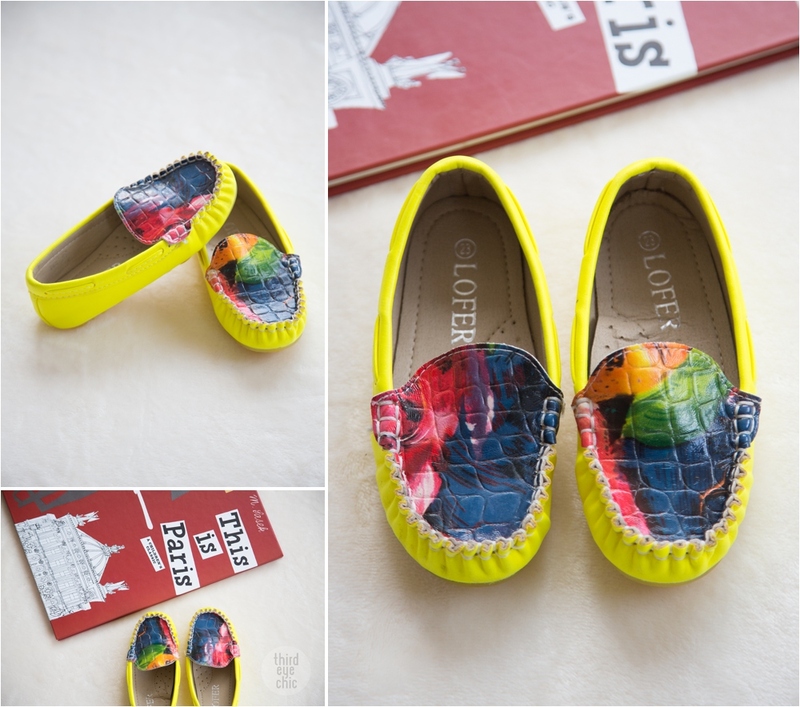 These are the cutest l'll loafers I have ever come across! It was a very random find in India (just like this quilted jacket) at a tiny mom and pop shoe store at a strip mall. I bought the smallest size available and it's just starting to fit my 3-year-old. I am hoping she can make good use of these before the heavy duty winter boots come out of the closet! Stay tuned for an outfit post featuring these next week! On a side note, I am collecting This is series of books by Miroslav Sasek for her and This is Paris was first of the series, which I bought after our trip to Paris to keep reminding her of some of the things we saw there. She doesn't remember much any more since that was a year ago, but it's still fun to read it to her. She sits still for only 3-4 pages but that's OK. I'll keep trying -- the book is beautifully illustrated and so informative! Currently crushing on couple of clutches (say that 10 times fast!). 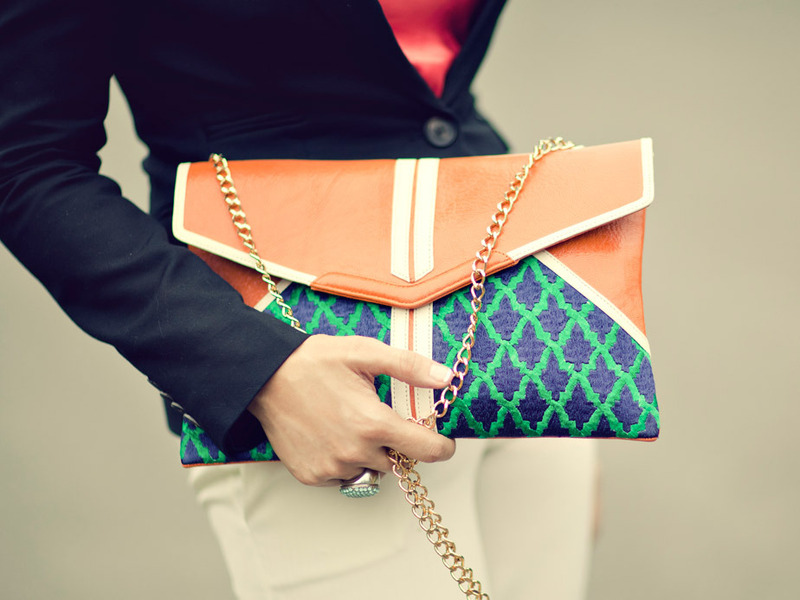 Love this Anfa Envelope Clutch by Popinjay (+ rest of their collection!). And Candela Novembre is flaunting the second one on the streets of Paris at this week's Paris Fashion Week. With their bright hues/patterns and intricate work, it's almost like carrying two pieces of art - one ethnic and one contemporary. Aren't these clutches something something?